Greenville has long been known as the Treaty City. 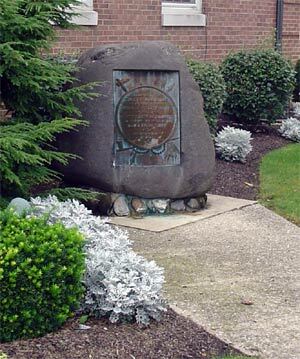 It is also home to a major home appliance manufacturer, was the birthplace of one of the world's best known marksmen, one of the 20th Century's most inspirational speakers, and is the county seat of Darke County named for the Revolutionary War general William Darke, the man that helped turn the tide in the biggest American military loss. Before it was the city of Greenville it was military encampment called Greene Ville named by General Anthony Wayne in 1793 to house his army during the long frontier winter. At the time it was the largest log fortification ever built and named for the American patriot Nathaniel Greene. The walled encampment was located on 55 acres of land and was able to support some 2000 American troops and would be the location of the signing of two American treaties. The Greenville Treaty signed in August of 1795 and the final Indian peace treaty signed with future President William Henry Harrison in 1814. Today when visitors arrive at Greenville, they're reminded of its historic importance with flags and markers announcing this to be The Treaty City, the site of Green Ville and that it is the home of a legendary sharp-shooter. Not only was Greenville home to Annie Oakley but also Lieutenant Commander Zachariah Lansdowne, pilot of the ill-fated Shenandoah Airship. A very youthful Norman Vincent Peale lived here for a time with his family while his father, a Methodist Minister, tended a local church in Greenville (Peale was actually born in Bowersville, Ohio, but his family moved to Greenville when he was 12). The Garst Museum reflects on their lives and the contributions this community has had, not only on the state but, also America. Each year the museum plays host to a historic themed festival known as "The Gathering at Garst" during the last weekend of July. Summer activities include the Annie Oakley Festival, Steam Threshers Reunion and the Darke County Fair. Fall and Winter presents the Famous World 100 race at Elora Speedway, the Autumn Farm Fast and the lighted horse drawn carriage parade. Greenville has over 20 antique shops in and around the city enticing any collector to make a stop in this historic Ohio city. 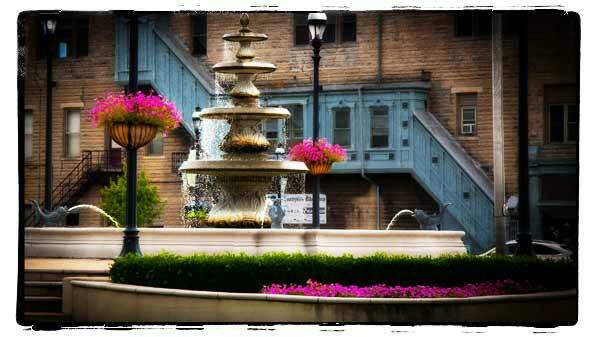 At the heart of historic downtown Greenville is a beautiful fountain at the center of a large round-about that can be a bit intimidating the first, second or third time visitors have to navigate through the multiple intersections. However, once you get used to the operation, it seems quite natural. Greenville Ohio is also home to world famous KitchenAid stand mixers and Bear's Mill, one of only 50 water powered mills left operating in the country. Located on what was once the Greenville Power Plant (remnants of the plant are still visible) the Prairie Ridge Park has been created to represent what many of the prairies in western Ohio may have looked like. 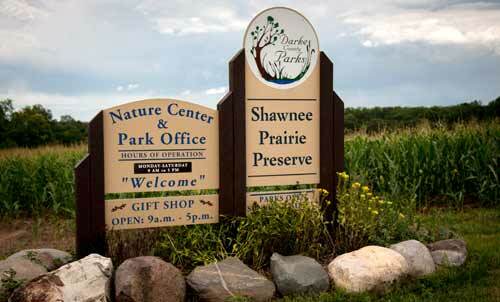 The park includes over 100 varieties of grasses and flowering plants that were native to Darke County. Prairie Ridge is connected to the Tecumseh Walkway via an abandoned railroad trestle. As part of the Prairie Ridge Park is the Anthony Wayne Peace Council House which is a recreated Peace Council house that was used by Native Americans at the time of the signing of the Greenville Treaty. The Council House is open sporadically on weekends throughout the warmer months. The park is located on the northwest side of Greenville Creek and south of Wilson Drive. Fort Greenville was abandoned in 1796. It became a source of supplies attracting scavengers through-out the territory. It also attracted Tecumseh and his brother the Prophet. They had not signed the Treaty of Greenville and in fact did not consider themselves bound by it. Returning in 1805 to the site of the treaty, the 2 brothers defiantly built a new village upon the site. Tecumseh grew stronger and with his brother providing spiritual assistance, the area became a magnet for those wishing to continue the fight against the Americans. Today Tecumseh Point Walkway is a small peaceful park with historic markers reminding us of its turbulent history along the Greenville River. The walkway leads to the confluence of Greenville and Mud Creeks. 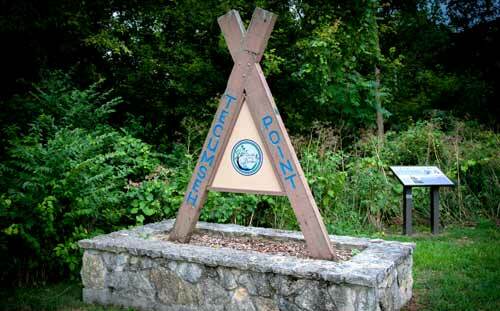 The point formed by the two streams is now known as Tecumseh Point and where Chief Tecumseh called home from 1805 to 1808. Located southwest of Greenville, Shawnee Prairie Park and Nature Preserve is the county's largest park at 120 acres in size. The park includes more than 2 miles of level trails and includes observation points for better view of plants and wildlife. The Nature Center provides educational displays, bird and animal observation areas, and a gift shop. The park was once part of the historic Prophetstown founded by Tecumseh's brother, known as the Prophet. Greenville is the county seat of Darke County. The county was named for Colonel William Darke who fought in the American Revolution and was present at Yorktown to see Cornwallis surrender. During the disastrous battle of St. Clairs Defeat in November 1791, Colonel Dark was in charge of the left flank and rallied the troops into making 2 bayonet charges against the Indian lines. The first was beaten back, but the second charge was successful and nearly 300 of the soldiers were able to escape the deadly trap, making their way back to the safety of Fort Jefferson. Colonel Darke lost his son, Captain Joseph Darke, during one of those charges and is remembered at the battle monument in Fort Recovery Ohio.